Archaeological Survey of India Collections, taken by Edmund William Smith in 1893. 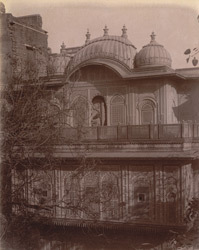 The house is considered a fine example of Mughal domestic architecture, and at this time was still the zamindar's residence. Built of red and white stone and covered with richly carved jali screens, the house was partly erected by Durga Pershad's ancestors during Akbar's reign (r.1556-1605). It was finally completed eighty years before this photograph for the Archaeological Survey of India.